NO CHEAP IMITATION! This knife is an exact replica of knives carried by marines in WWII. 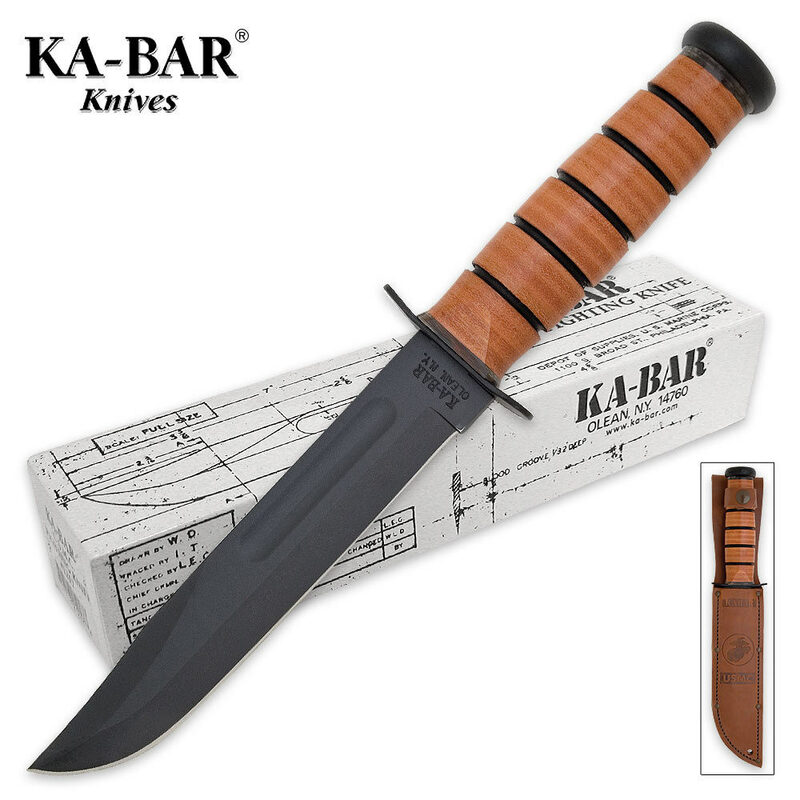 Made by KA-BAR in Olean, NY for the US Marine Corps and first introduced in WWII. 5" polished leather handle with steel hammerbutt cap. Steel guard and 6 7/8" gun blue blade with deep blood groove. Comes in issue box with a genuine leather sheath with USMC logo and extra heavy stitching and metal staple side reinforcements. Tang marked USMC. I cannot any difference between this and the one I used to carry. Got another for my stepson for Christmas. He is a Marine also. My grandson joined the U.S.M.C and I bought this knife for him , I figure every marine needs a damm good knife and he got one . Awesome blade. Sharp right out of the box. This Marine is wearing his KA-BAR right now. Bought one of these last year, holds a great edge, is tough great for making spears. I have bought 3 of these knives and they all came as pictured. One I sharpened and use on hunting trips, one I put up, and one I gave to a friend that was in Nam. He said it was just like the one he had over there. I was in Central America and the knife is the same but the sheath I had down there had a sharpening stone attached. The are really great knives. The Ka-Bar knife is, in my opinion, one of the greatest knives in the world. For under $100, you get a knife that will go through anything. The handle is comfortable and provides a good grip and the leather sheath is good quality. The blade has a good looking finish on it and it doesn't wear much with use. This knife can be used for slicing, stabbing, batoning, digging, prying, and anything else you can think of. Buy at least one of these because it will last a lifetime. nice big combat knife.a little big for daily carry,perfect for zombies,etc nice and sharp.base delivery took about a week.Awesome us mc Bowie overall. I love this KA-BAR USMC knife! I also own the black KA-BAR 1213 knife with Glass Filled Nylon sheath. Both knives are great.